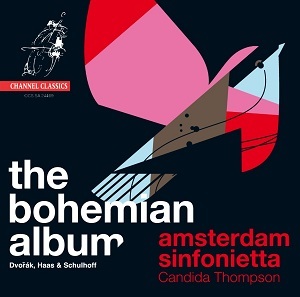 This superbly engineered disc continues one element of the recorded trajectory of the Amsterdam Sinfonietta which is to present augmented arrangements of string quartets. They’ve already had some success with their engorged versions of Shostakovich’s second and fourth quartets, Beethoven’s Op.135 and Verdi’s quartet, amongst other things. Now we come to a very different repertoire. The vin ordinaire, as it were, is Dvořák’s evergreen Serenade in E – which is an authentic work authentically performed. But we then have Pavel Haas’s Quartet No.2 and Ervin Schulhoff’s Five Pieces, which have been inflated to chamber orchestra size. I have no rooted objection to this in any way. In fact it’s been done before in the case of the Haas. The Australian Chamber Orchestra and Richard Tognetti recorded it in his own arrangement (minus the final movement’s percussion part) on Chandos CHAN 10016. It was coupled with equally large-scale versions of Haas’s teacher, Janácek – the First Quartet – and Szymanowski’s Second. One has to accept that this arrangement will change the character of the work. For the Haas the Sinfonietta has six first violins, six seconds, five violas, four cellos, two double-basses and the percussion part. The result, it needs hardly stating, is a bigger, chewier, generally slower, less mobile, less rhythmically accented performance than one for the quartet. It masks the tensile, changeable, sheer strangeness of the quartet writing; it’s like bathing a face in shaving foam. This is particularly of concern in the Janácek-derived Moravian rhythms, where the verdant nature writing sounds heavier than with the eponymous Pavel Haas Quartet recording [Supraphon SU 3877-2]. The effect here and elsewhere – especially in the cart-lurching pictorial that is the second movement - is a smoothing out of the tensile and tactile writing; the bilious lurches and wayside folkloric dances are flattened. My further objection is that these folkloric episodes are written explicitly for an appropriately sized band; turning them into a regimental string section defeats the object spectacularly. I suppose I could go on; the lack of intimacy of the spectral third movement, the turning of novel sonorities into rather generalized amorphous gestures; the lack of genuine wildness in the finale. But equally I suppose, in the end, the chamber sized version is something else and should be judged on its own terms. The playing is really first class in this respect; this is a truly crack ensemble. The Schulhoff Pieces are again written for quartet. And again they lose their tart astringency and become more malleable, more parochial in their new arrangements. The second piece, a Serenata, is taken really rather slowly – it’s marked Allegretto con moto - and elsewhere we lose the occasional echoes of Stravinsky. One could quibble too that the tempo for the Alla Tango Milonga doesn’t really work taken quite this slowly. The blurry beefed up Tarantella ends another wonderfully played but to me rather dispiriting reading. Turn to the Schulhoff Quartet on VMS 138 for the real deal. The Dvořák Serenade gets a light, brisk and eventful performance. It’s certainly airy and nourishing but other performances have found more light and shade; the expressive mastery of Talich and the Prague Soloists in 1951 is an object lesson to one and all. I said that I had no real objection to these souped-up arrangements. It’s the effect they have that concerns me. It would incidentally be nice to know who made the arrangements and whether the Haas is derived from the Tognetti version with percussion added, or not. Despite the playing and the superlative recording, I can’t see why anyone should prefer to experience these two inauthentic versions to the original incarnations, unless it’s for the pleasure of hearing the fine playing.